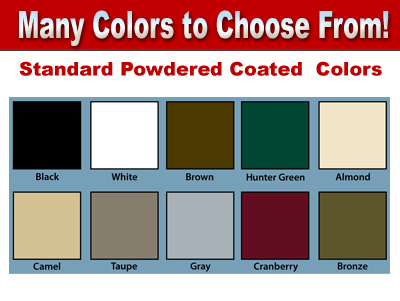 Storm Doors - Beejay Home Improvements, Inc. When it comes to the best screen storm door installation in Buffalo, New York, you can count on the experts at Beejay Home Improvements, Inc.
Our 24/7 Emergency Service and Fast, Professional Screen Storm Door Installation provides our customers with the reliable service they deserve! Call 716-894-8989 to Schedule your Screen Storm Door Installation Today! Is your screen storm door bent, broken, or not working properly? We carry a full line of locks, handles, hinges, and door pumps. 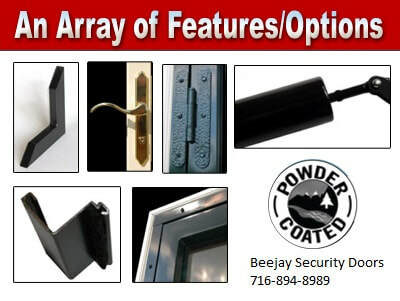 ​Call Beejay Home Improvements, Inc. at 716-894-8989 To Schedule a Screen Storm Door Repair Service Call. If repairing your screen storm door is not the best option then we may recommend replacing it with a new high quality Steel Security Door. Our High Quality Screen Storm Doors are manufactured with 16 Gauge steel frame with welded corners. The strongest storm door in the world, made right here in the good old USA! Many Premium storm doors will have as much as 4.5 inches of frame which takes away from your ventilation and view. 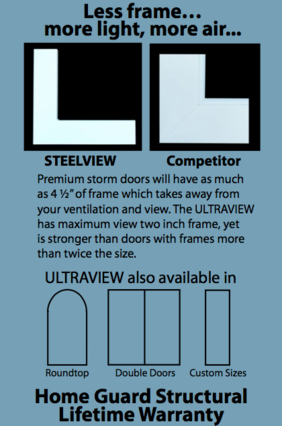 Just when you thought it couldn't get better, our ULTRAVIEW storm doors are available in a Rounded Top frame, ​Custom Sizes and in Double Door Sizes. at 1588 Broadway in Buffalo, New York 14212. If you are looking for a storm door that you will enjoy for years to come; you just found it. We set the standards that others follow. Once you see the quality in our Showroom at 1588 Broadway in Buffalo, there is simply no turning back. ​All our Ultraview doors receive a twelve stage wash before being E-coated and are finish coated with "Green Technology" Polyester Powder Coating! All our doors come with shatter resistant tempered safety glass with a weatherstripped aluminum frame to keep wind and moisture out. ​All doors included a fiberglass screen to let air in but keep pests out. Have A Question Regarding Screen Storm Doors?